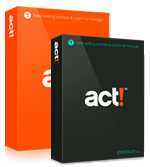 Home | Addons for ACT! Addons for ACT! blend seamlessly with Sage ACT! 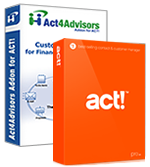 letting you customize ACT! to the way you do business. 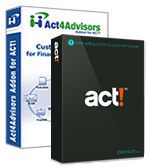 Click here for a complete list of Addons for ACT! With ACT! Email Connect for MS Outlook, you can start your Outlook email directly in Sage ACT! and send email from Outlook or send and attach to ACT!. No ACT! email client or ACT! addressbook is needed. Swiftpage gives you the tools to create beautiful email templates, send directly from your database and track your messages. You can also schedule to send, or choose to send as a different user or the record manager of each contact. Sync your Sage ACT! CRM data with all the latest Blackberry, Windows Mobile, iPhone and Palm OS devices, or with Microsoft Outlook. 2. Published minimum system requirements are based on single user environments. Actual scalability and number of networked users supported will vary based on hardware and size and usage of your database. Sage Software scalability recommendations are based on in-house performance tests using the recommended server system requirements found at: Sage ACT! Requirements to ensure your system meets these requirements. You must have one license of ACT! per user. Sage ACT! is the #1 selling contact and customer manager that helps you organize contact information, manage daily responsibilities, and communicate more effectively to improve your productivity. Note: Sage ACT! (Standard version) can only be used with up to 10 users sharing one database. If customer adds an 11th user or greater, ALL users must upgrade to the ACT! Premium EX or ST. Published minimum system requirements are based on single user environments. Actual scalability and number of networked users supported will vary based on hardware and size and usage of your database. Sage Software scalability recommendations are based on in-house performance tests using the recommended server system requirements found at. Sage ACT! Requirements to ensure your system meets these requirements. You must have one license of ACT! per user. **Note: Sage ACT! Pro (standard version) allows 10 or fewer users. If you expect to have more than 10 users, you must purchase Sage ACT! Premium. This version allows more than 10 users and gives you additional functionality. Click here for more a comparison of standard to Premium. Important Note for ACT! 6.x or Prior Customers: Customer activation and registration are required to use Sage ACT!. Certain features may have changed or are no longer available, including inbound caller ID functionality, WinFax integration, recording and playback of macros, email/modem-based database synchronization, and SideACT!. Note: Sage ACT! Pro (Standard version) can only be used with up to 10 users sharing one database. If customer adds an 11th user or greater, ALL users must upgrade to the Sage ACT! Premium. 4. Published minimum system requirements are based on single user environments. Actual scalability and number of networked users supported will vary based on hardware and size and usage of your database. Sage Software scalability recommendations are based on in-house performance tests using the recommended server system requirements found at: Sage ACT! Requirements to ensure your system meets these requirements. You must have one license of ACT! per user.